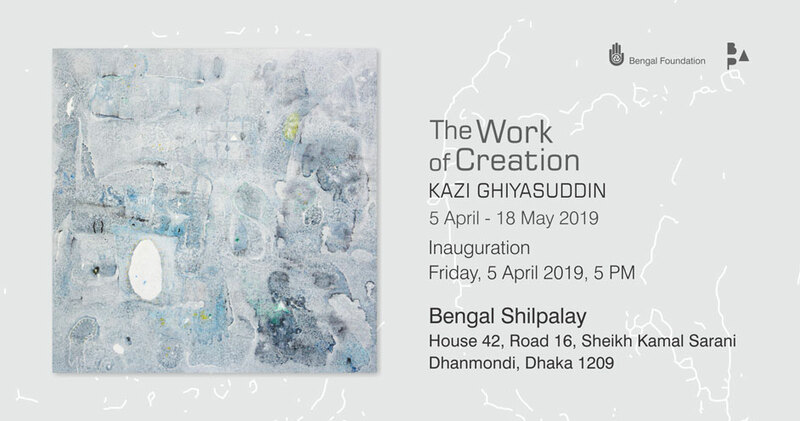 You are cordially invited to 'The Work of Creation', an exhibition of works by artist Kazi Ghiyasuddin, at the newly recast exhibition halls at Bengal Shilpalay, Dhanmondi. The exhibition will be jointly inaugurated by National Professor Anisuzzaman, Sir Fazle Hasan Abed KCMG, Founder and Chairperson of BRAC, and HE Mr Hiroyasu Izumi, Ambassador of Japan to Bangladesh, on Friday, 5 April 2019, at 5 PM. The exhibition can be viewed every day from 12 PM to 8 PM until Saturday, 18 May 2019, at Subir Choudhury Exhibition Hall (ground floor) and Quamrul Hassan Exhibition Hall (first floor).